Nowadays, making a website mobile ready goes pretty high on the request list for any business or organization developing a website. The demand for making everything accessible on mobile devices has become a key concern for all web designers and developers. However, there is a flurry of terms surrounding mobile. Mobile friendly, mobile optimized, and a newer term: responsive design. As the mobile space continues to see extraordinary growth, the importance of understanding the difference is becoming crucial. It could mean the difference between winning or losing a prospective client. A mobile friendly website is simply referred to as an HTML based website that doesn’t contain Flash. This is recommended for all websites to at least allow smart phones to be able to view the site the same as you can view on a desktop. And although it will appear smaller it is still perfectly functional. However, making it viewable doesn’t mean it is mobile optimized. With a mobile friendly website you have to pinch-to-zoom, scrolls left, right, up, down and figure out how the site “works” on a smartphone. Sounds troublesome? That’s because it is. This is where mobile optimized comes in. Mobile optimized is a far more advanced website that is designed specifically such that it re-formats for a list of handheld or tablet devices. The navigation buttons are larger, content is minimized and images are optimized for fast loading and display on smaller screens. Meaning these websites can easily engage a large mobile audience in making key buying decisions faster right from their handheld devices in the store itself. Having a mobile optimized website will result in happier and a larger audience of customers. Nonetheless, staying competitive in today’s world means you have to keep evolving with the trends and technology. With mobile devices ranging from handhelds to tablets, understanding how your website will display on the variety of formats is critical. A mobile responsive design is the new and best solution recommended by experts. A responsive website is one which is completely flexible, regardless of the device you are using. This is achieved by making the website adjust to the screen size of the device instead of creating specific websites for each device type. The rise in mobile browsing has increased and with it the need for providing the same experience on mobile web that you get from your desktop. The question is, is mobile friendly good enough? 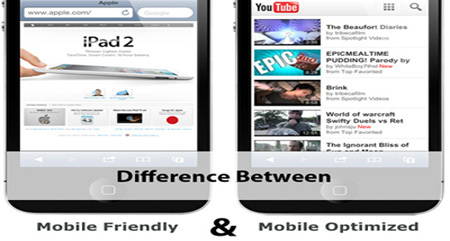 Should you discuss on making it mobile optimized or better yet invest in a responsive design? The answer is simple. Consider the percentage of mobile visitors to your site. (Google Analytics will tell you). Pull out your smart phone and see how your current site looks like. Is it impressive and easy enough for you to carry out your tasks? If not you’ve got your answer.